Nanoscale science and technology refers to the understanding and controlled manipulation of structures and phenomena that have nanoscale dimensions. Scientists have adopted the Greek word nano as a prefix to mean one billionth of a unit of measure. So a nanosecond is one billionth of a second, a nanometer (nm) is one billionth of a meter (m), etc. Over time, man has developed telescopes and microscopes that aid us in “seeing” the world around us. 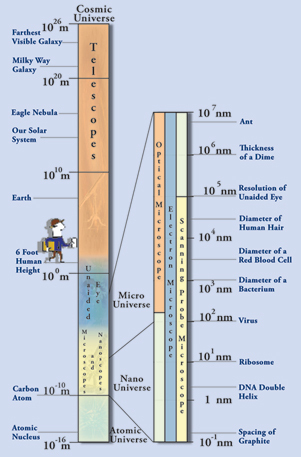 To put the nano or micro universe in perspective with our more familiar world, the spacing of atoms in matter is about 1/10 (10-1) of a nm; a strand of DNA is 2 nm wide; 100,000 (105) nm is about the diameter of a human hair which is about as small as the human eye can resolve; and a six foot person is about 2,000,000,000 (2 x 109) nm tall.